BACKGROUND: Infiniti is the luxury vehicle division of Japanese automaker Nissan. The brand is marketed in over fifty countries around the world, including Canada where the brand has an established hold in the luxury vehicle market. At the turn of 2018, the company announced it would become an electric brand, with all new vehicles either being hybrid or all electric by 2021. 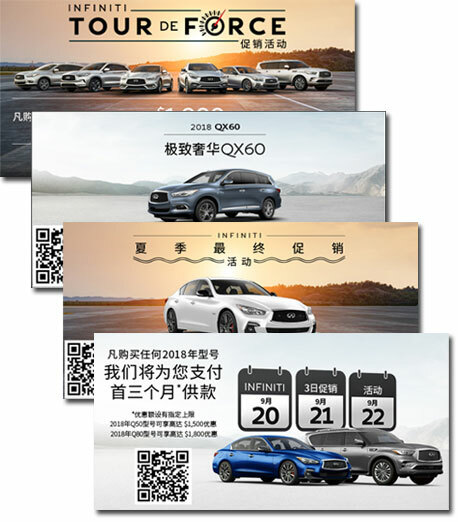 OUR WORK: Infiniti is committed to growing its brand among new Canadians. Sunflower’s British Columbia ethnic marketing office worked with the brand to execute a number of WeChat marketing campaigns. Our WeChat team provided a number of services including Chinese translation, graphic design, digital execution, and reporting.